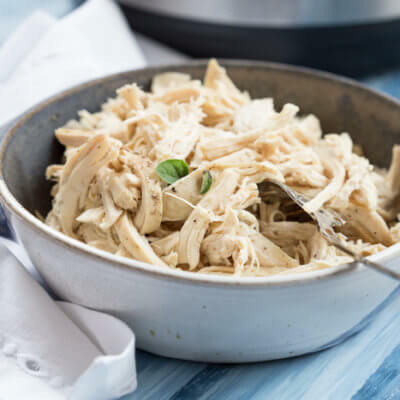 Instant Pot Shredded Chicken. How to cook chicken breast and thighs in the Instant Pot, even from frozen! IP chicken you will forever be my saving grace for easy weeknight meals. 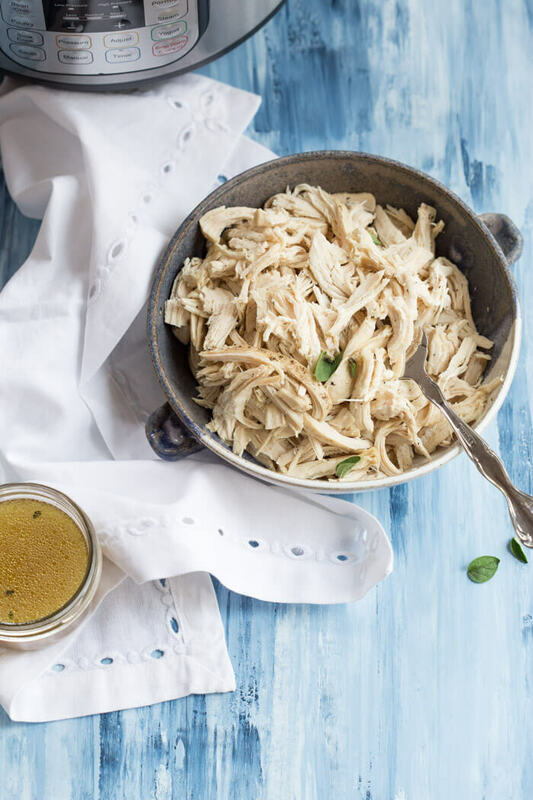 Instant Pot Shredded Chicken will be your new way to “bake” chicken because it’s crazy fast and oh-so-moist! Okay Instant Pot fans get ready! Goodbye slow cooker shredded chicken breast. Hello Instant Pot Easy Shredded Chicken. I love you too but I’ve found someone new. Seriously since we bought the Instant Pot , I haven’t even touched the slow cooker. It’s collecting dust and it will likely make it’s way to the giveaway pile that is stacking up in my garage soon. I’ve been all about minimalism since the end of last year because stuff… it collects and it’s time to purge and only keep the things that you truly love and use and sparks joy #mariekondostyle. All the old clutter just makes life more messy and difficult. Yeah, it needs a royal clean out because it’s been receiving the brunt of my cleaning sprees. Everything that is set to giveaway gets piled in the garage and then I don’t want to put it in my car because lizards and snakes and heavens knows what else could be in there. We live in an old house so the garage is, well… not 100%. I’m going to have to call a service to come and pick up our stuff or find someone with a truck. Do ya’ll have this problem too? At least I don’t have to look at the clutter until I go into the garage to get our bikes or the stroller or P’s outdoor toys. Honey, if you’re reading this. Garage clean out is happening… this weekend. Any takers for garage clean out? 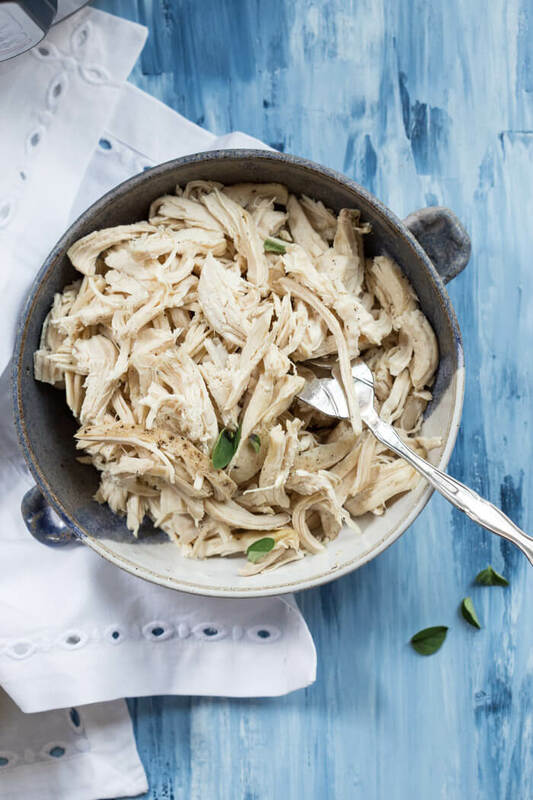 So Instant Pot Easy Shredded Chicken because we all need a little simple, convenient, and minimalist way to cook. I’m telling ya. This is the EASIEST way to make shredded chicken that you need for EVERYTHING. If you’re looking for shredded chicken recipes, check out this round up post we did with our favorite recipes using shredded chicken breast. 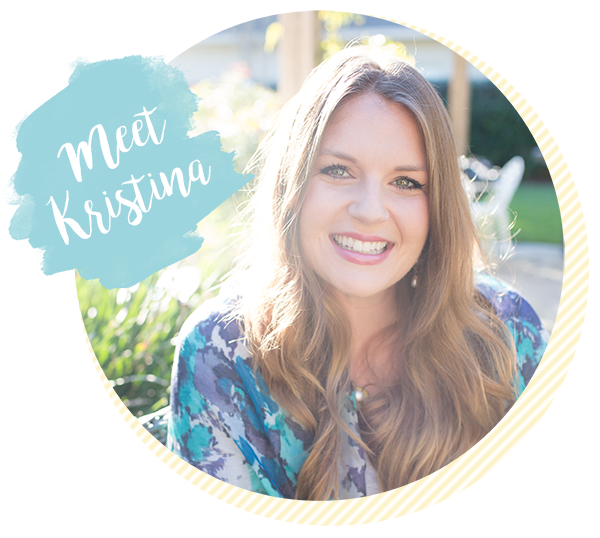 Some of my personal favs are Instant Pot Chicken and Yellow Rice, Instant Pot Whole Chicken, and Instant Pot Chicken Tacos. Can you tell I’m a big fan of my Instant Pot???? Can you cook frozen chicken breast and thighs in instant pot? Guys, Instant Pot frozen chicken is SO EASY. Forget to take your chicken out of the freezer in time to thaw for dinner? 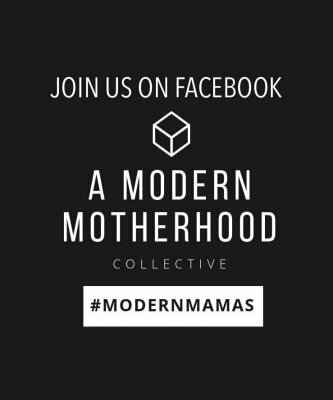 No problem mama! Instant pot frozen chicken breast is ready in less than 30 minutes from start to finish! 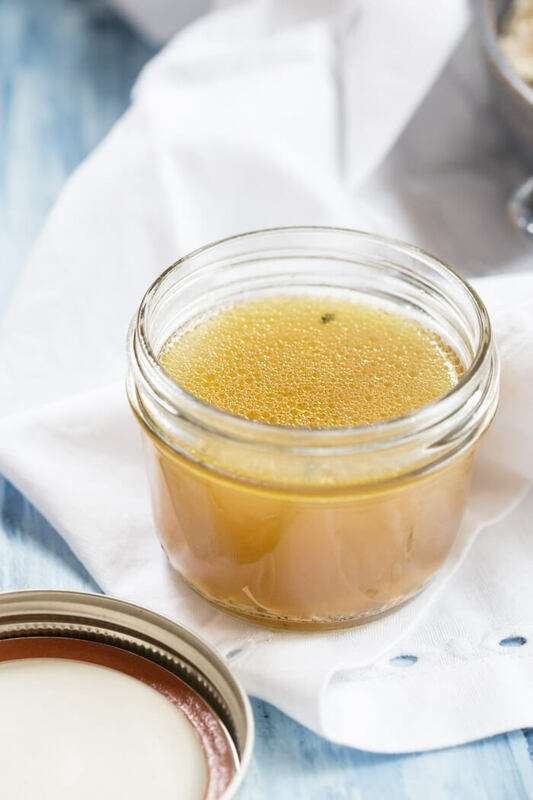 TIP: Just be sure to arrange the chicken breasts evenly on the bottom of the instant pot, if chicken breasts are frozen together it will require longer a longer cooking time to ensure chicken is cooked through. Cooking frozen chicken in instant pot is your new favorite method for a fast and easy weeknight meal! 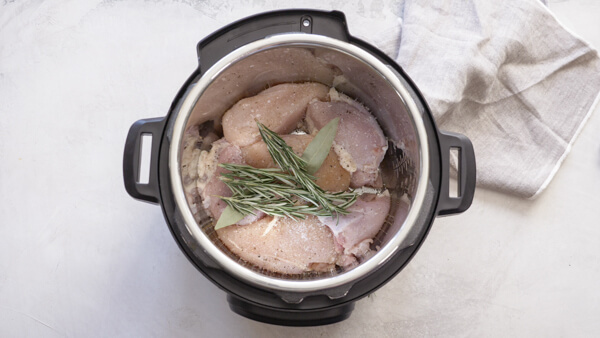 But you might be wondering, how to cook frozen chicken breast in instant pot? 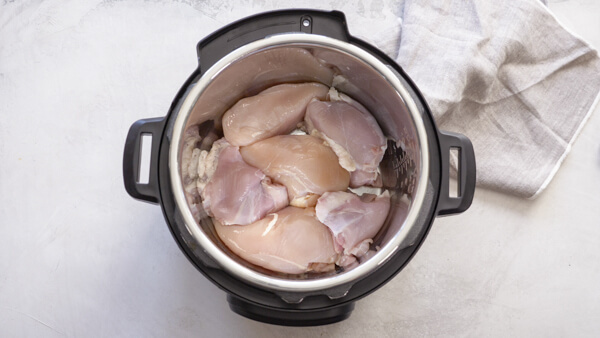 Check out the steps below for how to cook frozen chicken in Instant Pot! 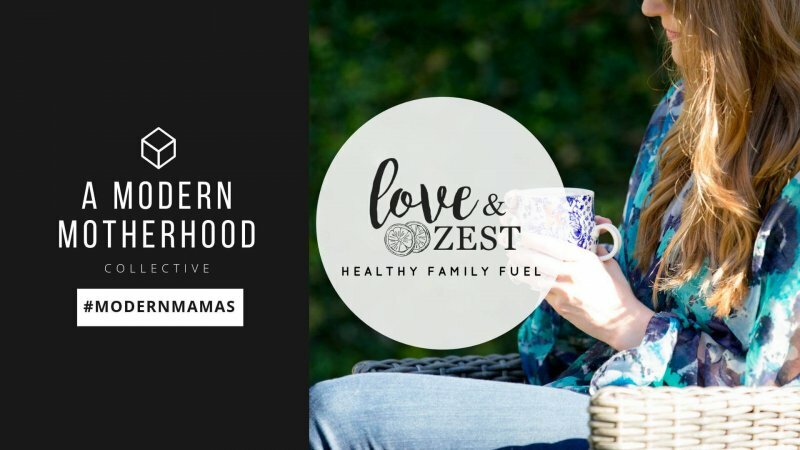 Why we love adding chicken thighs to instant pot? Flavor, flavor, flavor. That extra fat on the chicken thighs provides so much more flavor and keeps your chicken nice and moist. It’s literally a game changer! Ya’ll it’s just that good. I urge you to try it! While you’re at it, check out this recipe for Easy Baked Chicken Thighs. 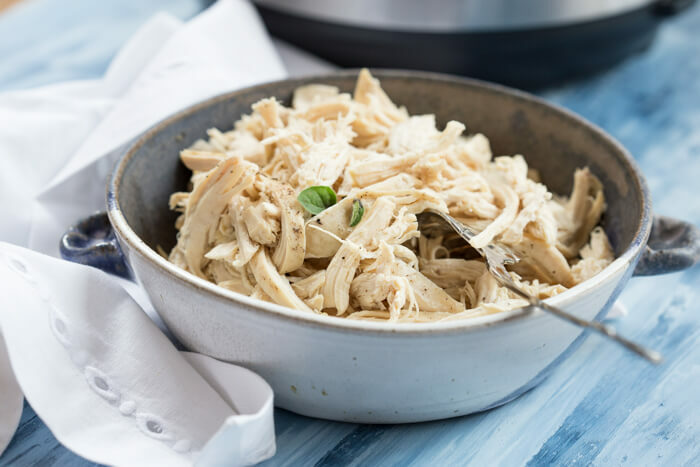 How to make instant pot shredded chicken? First, grab your IP. 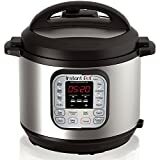 And if you need an Instant Pot for your kitchen too, I’ve gotchu– this is the one I use: Instant Pot IP-DUO60 7-in-1 Multi-Functional Pressure Cooker, 6Qt/1000W . 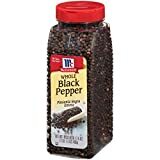 Toss chicken breast (fresh or frozen into the Instant Pot)….add yo favorite spices. Put the lid on the pot and seal it. YEP… NO WATER NEEDED… and it makes a wonderful chicken stock too… which I always save for later. Press the poultry setting, and let that baby cook and depressurize naturally for 15 mins. 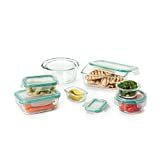 I don’t usually do a lot of meal prepping, but this is one that I keep on a weekly rotation so that we have protein at the ready. When I make it, I’ll freeze anything I’m not going to use in the next few days. 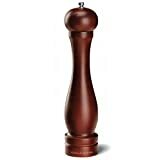 Easy, simple, and effortless. 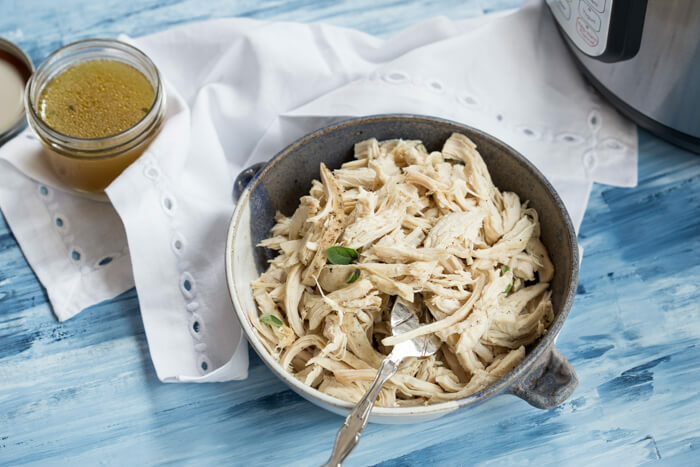 You’ve gotta have this Instant Pot Easy Shredded Chicken in your life. 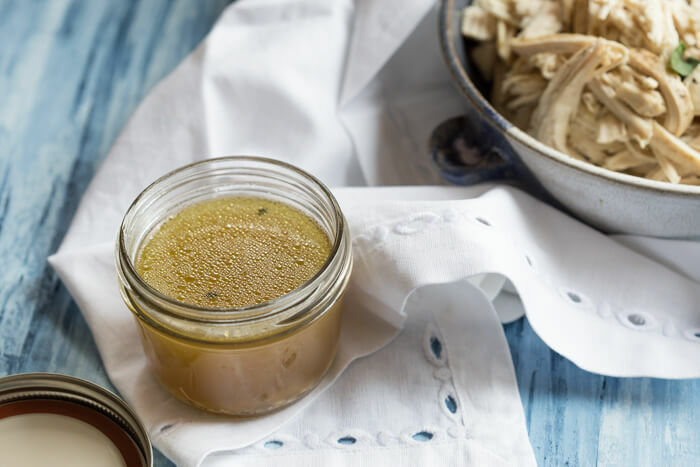 Place chicken in the Instant Pot, add favorite spices, drizzle with olive oil. No need to add water, the chicken creates it’s own natural juices. Place lid on the Instant Pot and seal. Press POULTRY Setting (which is 12 minutes). Once finished cooking, allow to depressurize naturally for 15 minutes. Remove from pot and shred. 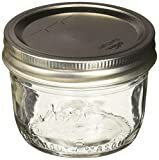 Store chicken stock in airtight container for later use!